With a growing population estimated at 309,156, the Bahamas has a rich and varied population consisting of African, European, and Asian descent. Primarily made up of blacks between the ages of 15-64 years of age, the people of the Bahamas, or Bahamians, are a soft spoken and laid back people, typically found throughout the Caribbean. Quick with a smile and a greeting, the Bahamians are known for their pleasant, and easygoing ways. Even first time visitors cannot help but be impressed by the genuine friendliness, and gentle good will of the people of the Bahamas. Their unspoken motto echoes that of Will Rogers, in that they never meet a person they don't like. The Bahamas stand out as a true paradise among the islands that make up the Caribbean. Just southeast of Florida in the United States, and north of Cuba, this jewel of the Atlantic is an island chain consisting of 29 islands, 661 cays, and 2,387 rocks, that make up almost 14,000 kilometers of pure blue tropical waters and pristine beaches. The aptly named Paradise Island comprises the best-known tourist destinations, with challenging golf courses, white sand beaches that nearly encompass the island, and some of the grandest, most sought after five star hotels available. Home to the world famous Atlantis Resort, with its 34-acre marine habitat and popular aquarium, Paradise Island is the ultimate location for the vacation of a lifetime. From the lovely and artistic wood carvings in the shops throughout the islands, to the majestic tropical scenery and turquoise cays of crystal clear waters, there is more to see and do in the Bahamas than you can possibly accomplish in a single vacation. All of islands that comprise the chain are normally low and flat, with ridges that rise approximately 49 to 66 ft. 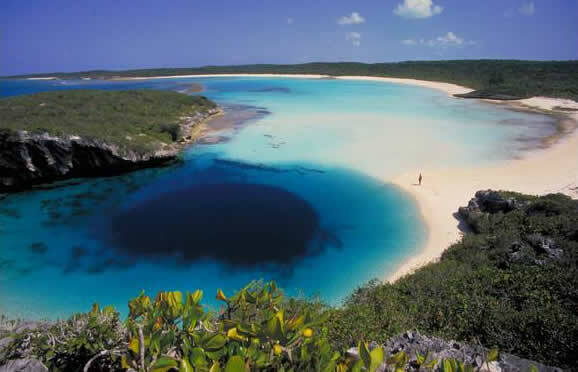 The highest point is Mount Alvernia on Cat Island, formerly known as Como Hill, with an elevation of 210 ft.
With a subtropical to tropical climate moderated by the waters of the Gulf Stream, the Bahamas enjoy a sunny, summer atmosphere year round. This provides for a great range of tropical flora and fauna with a countryside thick with lush palm trees and tropical flowers. It also provides the necessary climate for the many lush sugar cane plantations that dot the inner islands. Descubierta por primera vez por los españoles que siguieron la estela de Colón, la cadena de islas de las Bahamas tiene una rica historia. Se estima que los taínos primero emigraron a las islas del sur de América del Sur alrededor del siglo séptimo dC, y pronto se despobló por los españoles, que les impresionó a la esclavitud. Hasta la mitad del siglo 17 las islas permanecieron, para todos los intentos y propósitos, deshabitadas. En 1648, los puritanos ingleses establecieron el primer asentamiento europeo permanente en las islas, y por 1670 se le concedió el control de las islas para el Señor Propietarios de las Carolinas. Bajo su gobierno, las Bahamas se convirtió en famoso como un refugio para los piratas que saquearon el Caribe, y un importante puerto para el comercio de esclavos. Muchos esclavos africanos fueron utilizados en las plantaciones de caña de azúcar allí, y la afluencia de oro de los piratas hicieron Nassau tan infame como Port Royal. Para restablecer el orden, la corona británica hizo las islas en una colonia británica en 1718, y sigue siendo una Commonwealth del Reino Unido en la actualidad. El acuario al aire libre en el Atlantis Resort: El acuario al aire libre en el Atlantis Resort cuenta con un hábitat marino de 34 hectáreas con 11 lagunas de exhibición y piscinas que son el hogar de más de 200 especies de vida marina. A través de una pasarela de acrílico grande que viaja a través del hábitat están inmersos directamente en el interior del acuario. Parque Nacional de Lucaya: Parque Nacional de Lucaya Kayak y Cave Tour en la isla de Grand Bahama ofrece tres excursiones diferentes para su placer. Kayak, espeleología y nadar son un solo paquete en una de las playas más hermosas de la isla. Reme por un hermoso bosque de manglar, seguido de un picnic en Gold Beach, donde se puede tomar un baño, y luego disfrutar de un paseo por la naturaleza maravillosa con varias cuevas naturales. Blue Lagoon Island: A sólo tres millas de Nassau es Blue Lagoon Island donde el mundialmente famoso Dolphin Encounters lo hace en casa. Aquí se puede nadar con, y conocer, el más suave de los mamíferos marinos de cerca y personal. Contrary to popular belief, it is Cable Beach, not Nassau, that offers the best in nightlife entertainment. 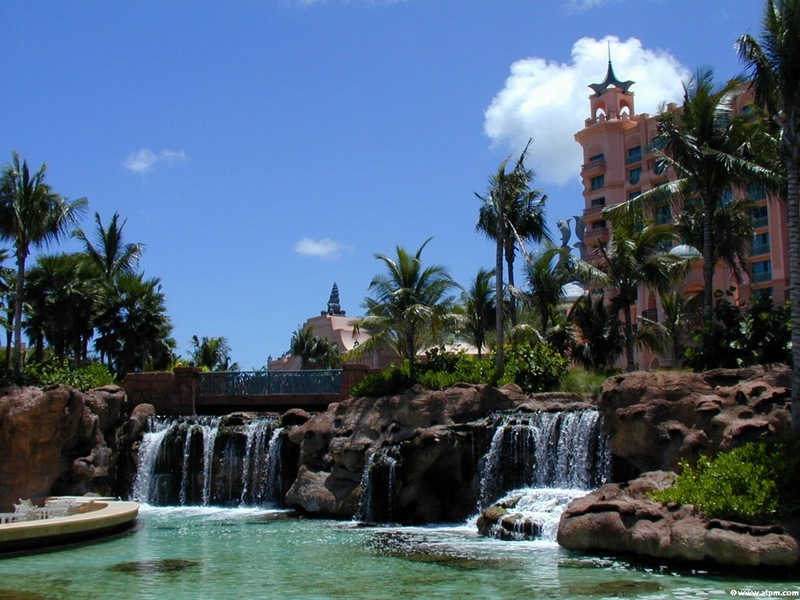 The Wyndham Nassau Resort and Casino not only hosts one of the largest casinos on the island, but it also houses an 800 seat theater, with grand shows running on the weekends and some week nights. If you prefer Nassau proper as the source of your nighttime entertainment, then a variety of nightclubs and bars are available. Charlie's on the Beach is one of the oldest and most well known nightclubs in Nassau, and most of the Nassau night life can be found centering around Charlie's. Although increasingly influenced by American customs, due to heavy tourism, Bahamian culture is a mix of African and European cultures. The predominant language of the islands is Bahamian English, a dialect of English influenced by Jamaican Patois and Bahamian Creole, although it should not be confused with either, but stands as a dialect all on it's own. Spoken by both black and white, it is often referred to by native Bahamians as "the dialect." Christianity is the main religion of the Islands, with Baptist forming the bulk of the religion, followed by Anglicans, Catholics and Methodists. Seventh Day Adventists, and Jehovah's Witnesses are also represented, as well as a number of small "home grown" churches. While virtually any flavor of international food can be found in the Bahamas, Bahamian cuisine is a delicacy in its own right, consisting mainly of seafood. You will want to try an interesting local dish called conch (pronounced konk), which forms a staple of typical Bahamian meals. A firm, white, peach-fringed meat that comes from a large type of ocean mollusk it is usually served raw on it's own, or included as an ingredient in several seafood stews. Fresh fish is also a favorite of the Bahamas, and a popular brunch consists of boiled fish served with grits. Fish stew made with celery, onions, tomatoes, and various spices, is another local specialty that is highly favored throughout the islands. Bahamian cooking is always spicy, never bland, and flavored with local herbs, meats and produce. More than any other island in the Caribbean, Bahamian cuisine is the most influenced by the American South.